Retain your proof of purchase and warranty card. Proof of purchase with date, place of purchase and purchase price is required to obtain service under warranty. Model name label and production label must be available to identify the bedding and validate this warranty. This warranty extends only to the original purchaser. What is a warranty in general? As all manufacturers have their own conditions we suggest you read your specific warranty card carefully. A warranty serves as an agreement between the customer and manufacturer that promises to replace or repair goods purchased within a specified time period. It is normal for the consumer to contribute to warranty costs, and these costs will be calculated by the total number of years owned multiplied by 1/10th (10 years Warranty) of the prevailing list price, plus transportation charge. Please note that the warranty is in no way an indication of the lifespan of the mattress for which it has been issued. It is also important to note that the warranty is null and void in the cast of a change of mind, choosing the wrong comfort level, failure to follow manufacturers instructions or misuse of the goods under warranty. We also reserve the right to refuse inspection and to invalidate the warranty if the product is deemed to be soiled, burnt, stained, infested with insects or in an unsanitary condition. If identical materials are not available at the time of repair or replacement, manufacturer reserves the right to substitute comparable materials or models and does not guarantee that the replacement will match the exiting or original piece. If a claim under the warranty is valid manufacturer will provide you with an equivalent replacement product or repair your product. Manufacturer's decision whether to repair or replace will be final. Most manufacturers and international mattress specialists recommend replacing your mattress every seven to ten years. What is excluded under warranty? 1. Normal Body impressions of 38mm (1.5 inch) or less. Note: Body impressions are a normal phenomenon of premium bedding and indicate that the comfort layers are conforming to your body. Impressions of 38mm (1.5inch) or less on the mattress in all sleeping areas are quite possible and not considered a manufacturing defects. 2. Firmness or comfort preference of the product. 3. 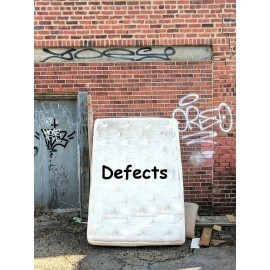 Mattress that is soiled, burnt or has received obvious abuse or improper care (please refer to the Mattress Care), such as mattress with inadequate support from a weak, mismatching size box spring or an improper bed frame, namely nest type and wooden rail type. 4. Mattress size that is within the tolerance level of ± 2cm in width and length. 6. Cover (fabric), bent border / grid wires. 7. Bending, standing or jumping on the mattress. 8. Product that is stained, soiled or infested with vermin even if defective. 9. Dust mites and bed bugs. 10. Merchandise sold " as-in", "distressed" or "floor model". 11. Failure to comply to manufacturer's care and maintenance instructions. What is covered by Bed Frame limited warranty? Bed frames and storage bed carry 6 months or 1 year frame structure guarantee. This guarantee covers only a free or at our option to replace free of charge (other than transportation and upholstery cost) for the wood structure in our bed frames within the first 1 year due to defect on workmanship only. This guarantee ensures that the wood is fungi free and free from powder post beetles. If identical models are not available at the time of repair or replacement, manufacturer reserves the right to substitute comparable materials or models and does not guarantee that the replacement will match the existing or original piece. All information is correct at the time of updating the website and subject to change without prior notice. Please contact 67442333 for more information.